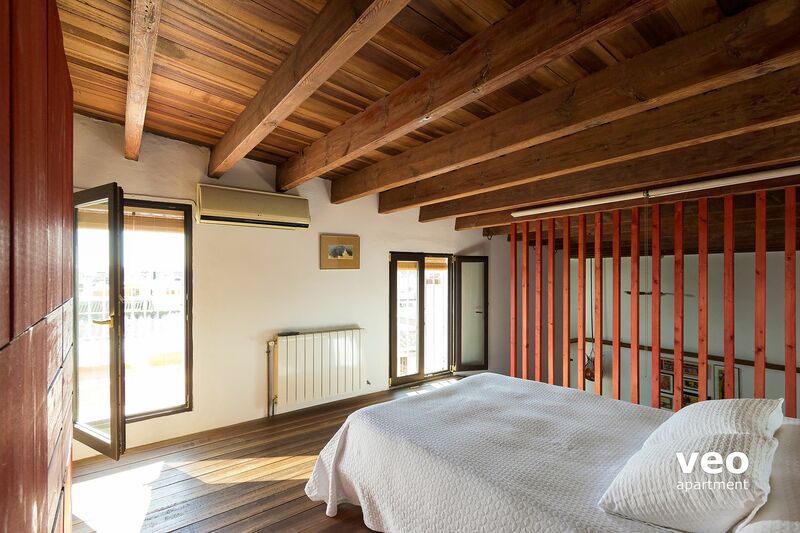 Ático dúplex con 1 dormitorio, terraza privada y vistas a la Catedral. Muy tranquilo, está situado en el pintoresco barrio de Santa Cruz, en la calle Conde de Ibarra, a pocos pasos de los principales monumentos y lugares de interés. 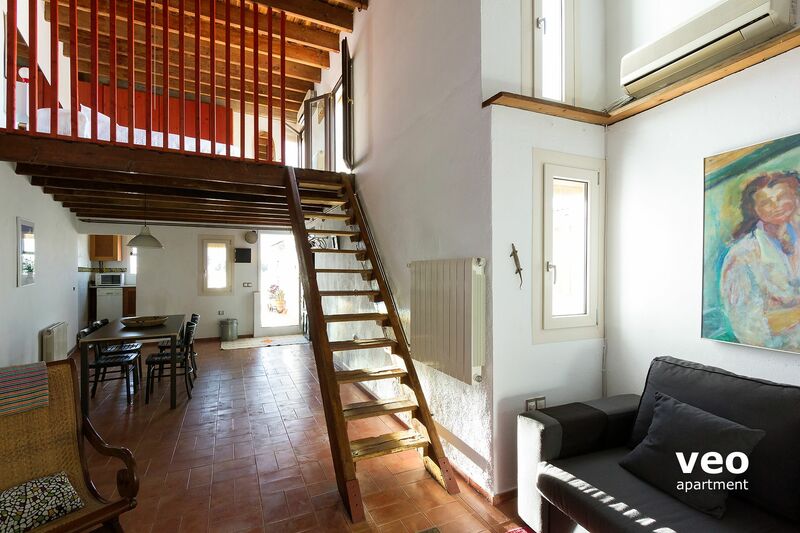 El propietario ha decorado el apartamento con gran atención al detalle. 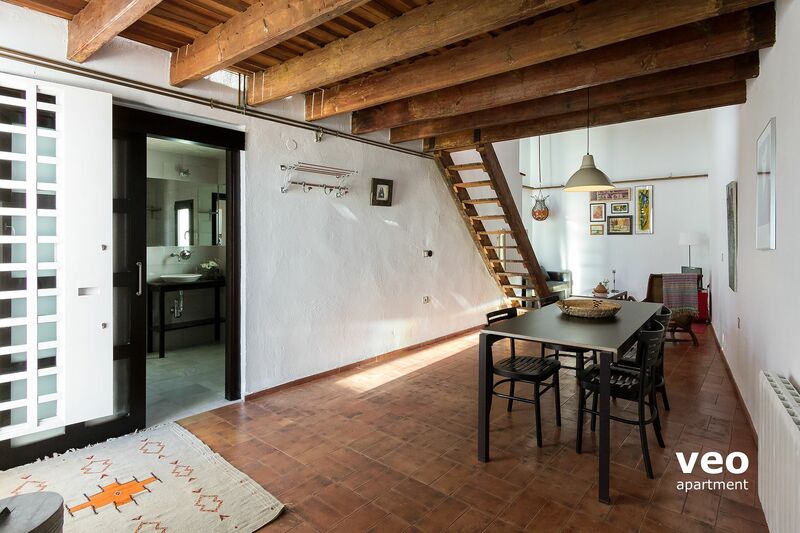 Los interiores son luminosos y abiertos, con un diseño tipo loft - sin puertas. Techos altos aumentan la sensación de espacio y confort. Vigas de madera vista, suelos de madera y terracota, y obras de arte originales. Aire acondicionado, calefacción, teléfono (ver condiciones) y acceso gratuito a internet WIFI. En la planta inferior está el salón-comedor. Amueblado con un sofá, mesa de centro y televisión. Gran mesa de comedor y sillas. La cocina es pequeña pero bien equipada con vitro-cerámica, nevera / congelador, horno, lavavajillas, lavadora y todos los utensilios necesarios. 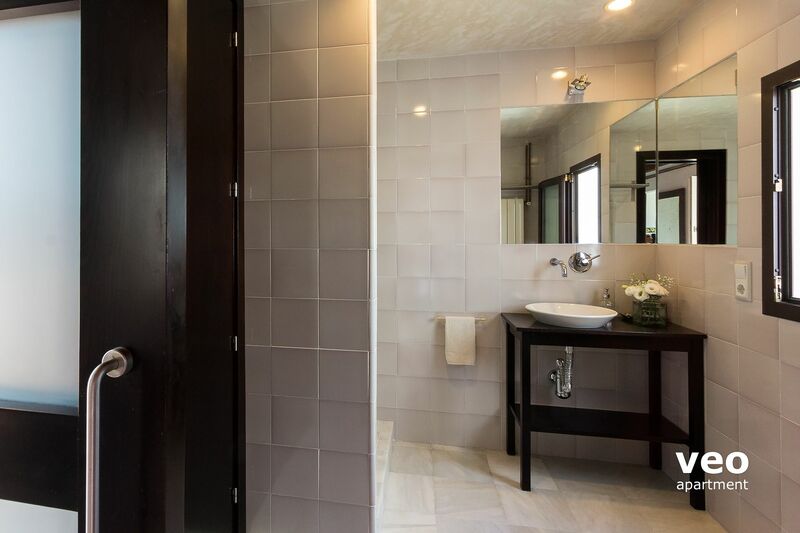 El cuarto de baño tiene un armario, lavabo, WC y una ducha a ras de suelo. 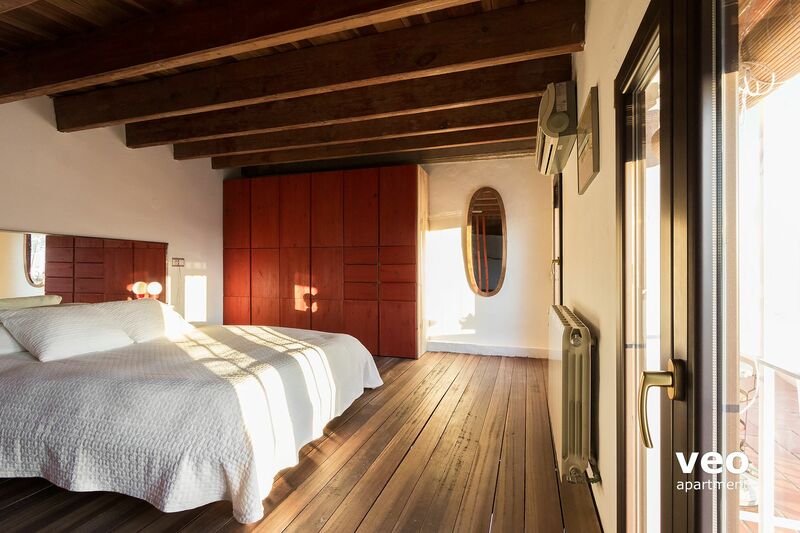 En la planta superior se encuentra el dormitorio con una cama doble (1,40 x 2,00 m) y un gran armario para guardar sus pertenencias. Una puerta abre a la terraza privada con vistas únicas de la Catedral. 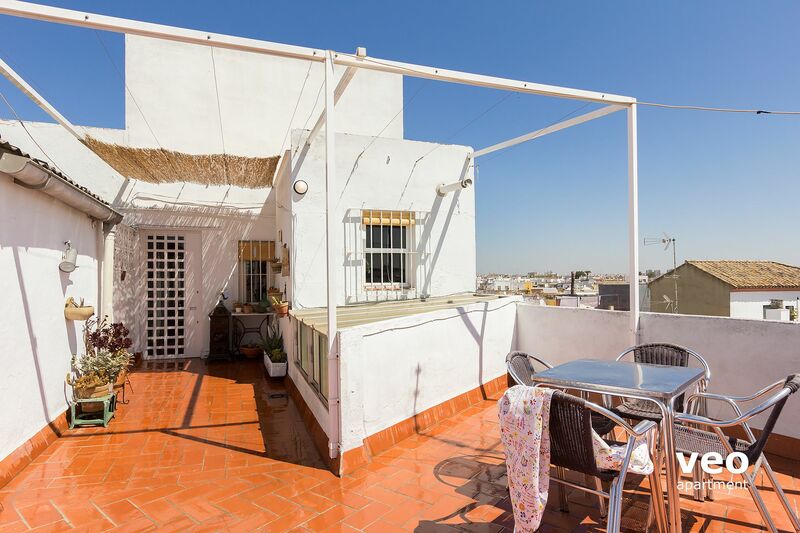 La terraza está orientada al sur-oeste, desde donde se puede disfrutar de una magnífica puesta de sol sobre los tejados sevillanos. Hay un espacio adicional al aire libre junto a la entrada del apartamento - que es compartido, pero rara vez utilizado por los residentes en el edificio. Ambas áreas exteriores están equipadas con mesas y sillas. Este apartamento se encuentra en la azotea (cuarta planta) de un edificio residencial, sin ascensor. Teléfono: Podrá llamar gratis a teléfonos fijos nacionales (no móviles) y recibir llamadas. Très joli duplex , avec tout le nécessaire pour un bon séjour. 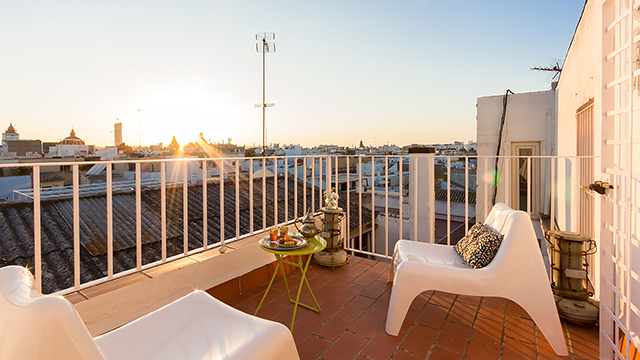 La petite terrasse avec vue sur Seville est un moment de bonheur ! Attention , escalier raide non adapté aux enfants et aux personnes âgées. "Magie sur le bord des toits"
Séjour de 4 jours, dans un environnement plus qu'agréable. L'appartement est conforme à la présentation. Très bonne prestation, de qualité. Les propriétaires nous ont donné des conseils pour visiter au mieux la ville. Et plus que tout, l'emplacement est parfait! Au coeur de la ville. "Beautiful apartment on the roof!" 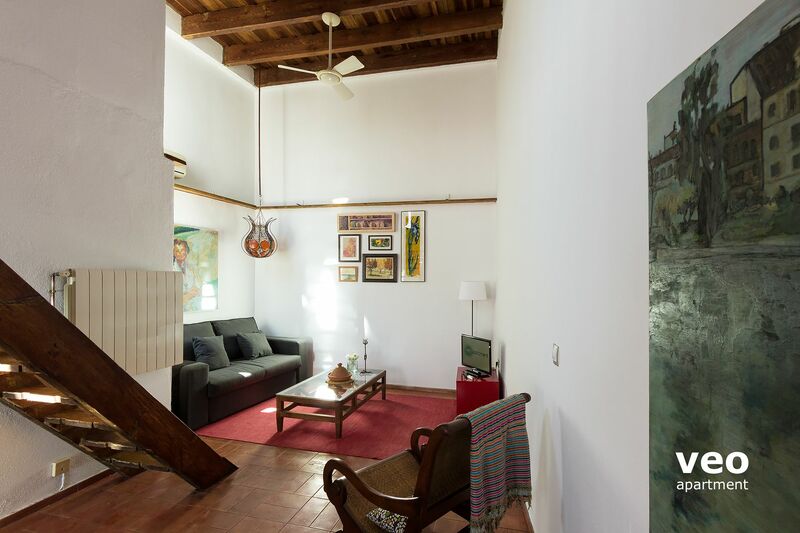 We loved the apartment, in a slightly less touristy part of town, but still only a 10-15 minute stroll to everything you need (except Triana which is about 25 min stroll). Beautiful bars for breakfast & tapas within a few minutes and a little 'corner shop' close by for water etc. 75 steps up to the apartment and the bedroom steps have a rail but need some concentration initially. 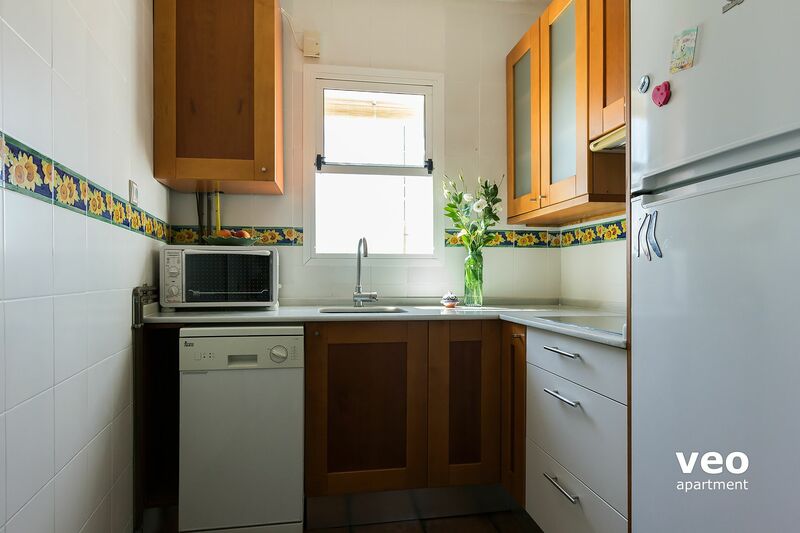 Apartment had everything you need - well stocked little kitchen and lovely bathroom. There is a communal space at kitchen level but we rarely saw anyone on it and could have happily had our breakfast out there. The little terrace space off the bedroom is beautiful and we had a little drink and tapas up there each night, beautiful views of the cathedral and city. 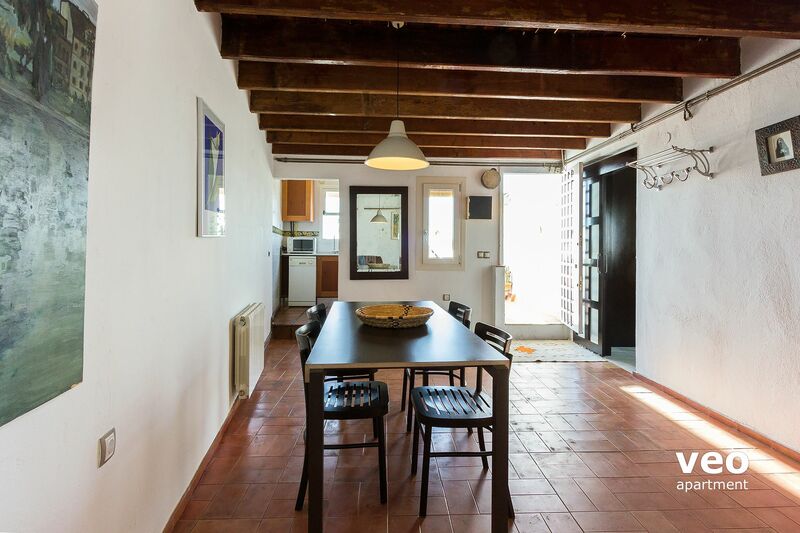 We would happily return to this beautiful apartment. We arrived at 01.00 and were greeted happily by Sandra who showed us around the apartment and were not charged a late fee. My bit of Spanish was helpful but I'm sure we would have managed without. Beautiful apartment highly recommended but if you struggle with stairs - you may need to be cautious!?? "Situé sur les toits de Séville, vue de la Giralda depuis le lit: c'est magique." Idéalement situé. Calme (même pendant la Féria!). Propre et bien décoré. Le lit en mezzanine, pas de séparation. Petit point à signaler: équipement minimum (juste ce qu'il faut en couvert, pas de micro-onde). Mais la vue sur les toits de Séville compense tout ça. Très bon accueil pour la remise des clefs. Everything was great! This is my second time staying in this apartment. Jesus met me at the apartment, and the check-in was very smooth. 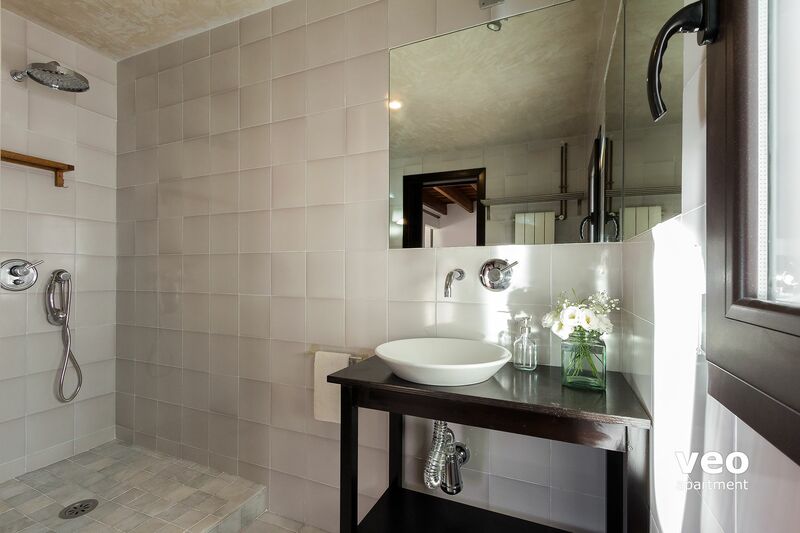 This apartment is really beautiful, very tastfully decorated, bright, spacious, with all amenities.The terrace is fantastic, and the views specatular. Appartement très sympa, avec ses deux terrasses. "Fabulous location, well equipped, great views"
The apartment was very comfortable, everything worked, good shower, central heating, wifi. Not suitable for anyone unable to cope with a lot of stairs. Nous avons passé de très bonnes vacances dans ce bel appartement, très bien situé, et possédant une agréable terrasse avec vue sur la cathédrale ! "Beautiful views in a perfect location"
Everyone was very helpful and all aspects of the booking,etc were easy and straight forward. Lovely apartment with a great location and views. We were however both very uneasy about the staircase. Potentially very dangerous. "Fabulous views on a perfect week"
Its a shame many people wont be able to stay at this gem because of the stairs up to apartment and to the bedroom, otherwise what a perfect rooftop place to stay, with full amenities and right in the middle of the historic centre. The location is amazing for all the attractions! We walked everywhere! Lots of cute restaurants and cafes near by as well. It was on a quick street close to a supermarket and pharmacy. There were a lot of stairs but we didn't mind. Sandra met us at the apartment which was super convenient for checking in. The light on the upper terrace was not working but the terrace was a great feature! 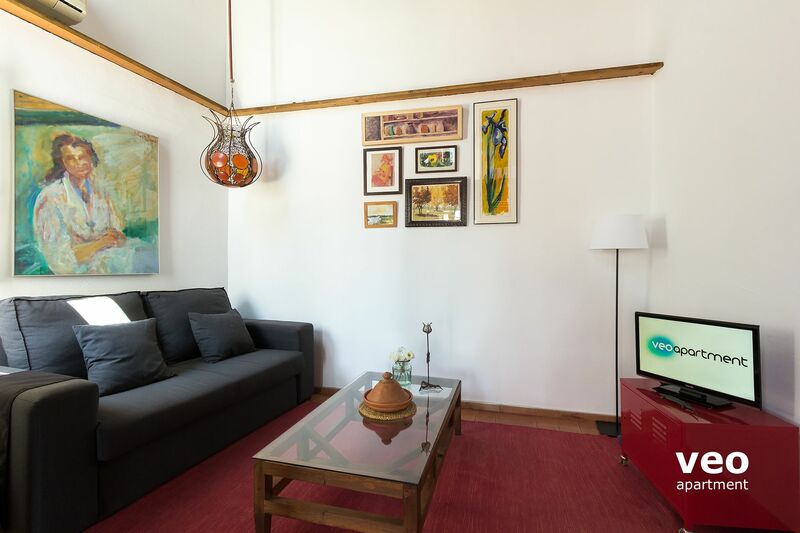 "Brilliant location, brilliant views across the city and everything you will need is in the apt. 70+ steps and no elevator though!" Great location! 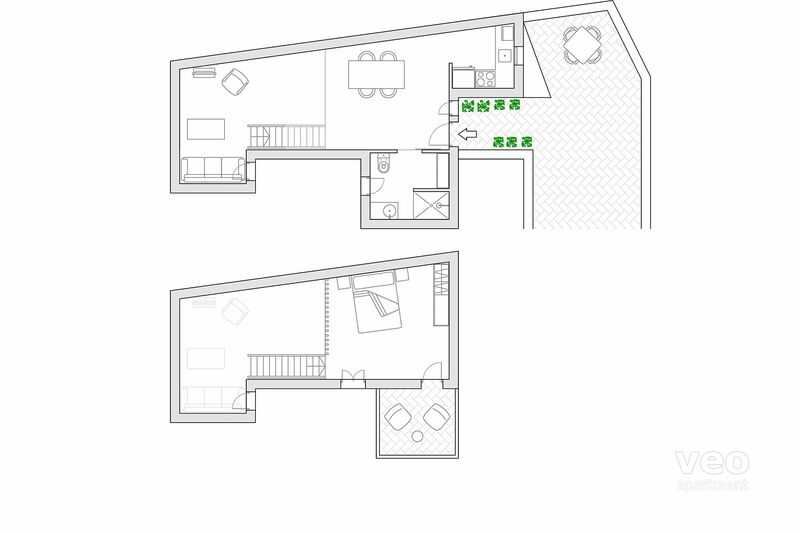 We were met at the apt on arrival and we were given details about the apt. We knew it was a walk up and so that was fine. Both the private and public terrace provided incredible $1,000,000 views at sunrise and sunset. The staircase to the loft takes a little to get used to, quite steep but there is a railing. "Idéal en couple ! Emplacement génial"
Très joli petit appartement et très agréable. La propriétaire vous accueille à votre arrivée. Emplacement idéal en plein centre de Séville pour les visites (vraiment à 5min de la cathédrale). Nous avons passé un très bon séjour en amoureux. "La estancia fue muy buena. Me encanto el apartamento,precioso, tranquilo, bien situado,"
Me gusto mucho el piso. Es un de los pisos mas bonitos que he alquilado en Sevilla. Sugiero que tenga mas sabanas disponibles, toallas, y si hay buen tiempo una tumbonas o algo para los que quieren tomar el sol. Yo no tenia bueno tiempo, pero la terraza es increíble y hay que aprovecharla. 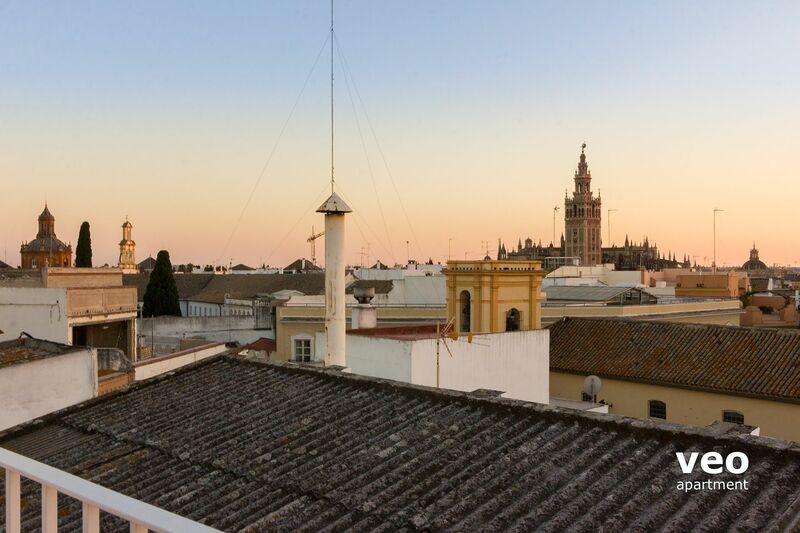 We enjoyed the views from the rooftop terrace in the middle of Sevilla. Walking distance close to everything. Everything was nice and clean. 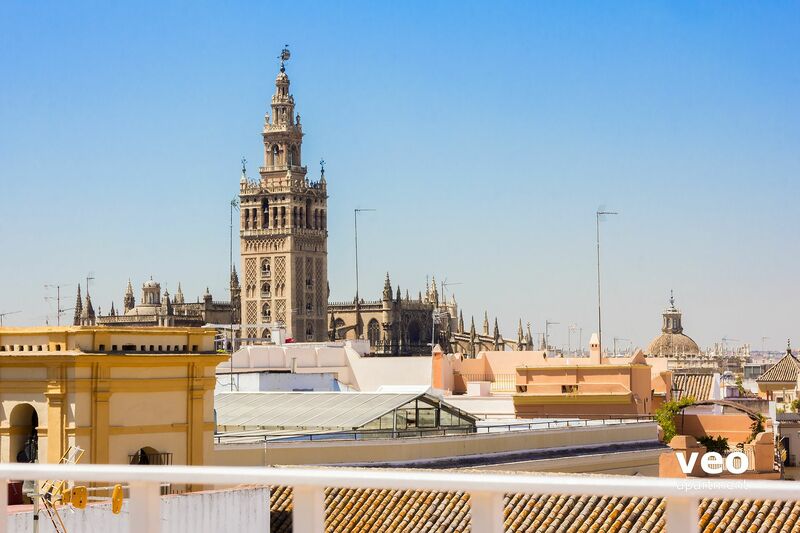 "Über den Dächern von Sevilla"
Das Apartment hat uns sehr gefallen und es gab für uns nichts zu beanstanden.Die Lage ist perfekt um die Stadt zu erkunden. Der Kontakt zu den Vermietern war sehr unkompliziert. Wir wurden mit frischen Obst empfangen.Alles nötige ist in der Wohnung vorhanden sogar Spülmittel und Tabs für die Maschine. Die Terrassen haben wir genossen, herrlich dort zu pausieren und dann wieder zu starten. Die Treppe/Stiege zum Schlafbereich ist recht steil, daher wäre es gut wenn oben an der Treppe ein Lichtschalter wäre. Die Schränke oben haben wir nicht benutzt - weil es unbequem ist die Sachen hoch zu bringen. Einen Schrank unten hätten wir besser gefunden. Das Apartment hat eine Spülmaschine. Da wäre es besser noch mehr Gläser und Tassen, Teller und Besteck zu haben. 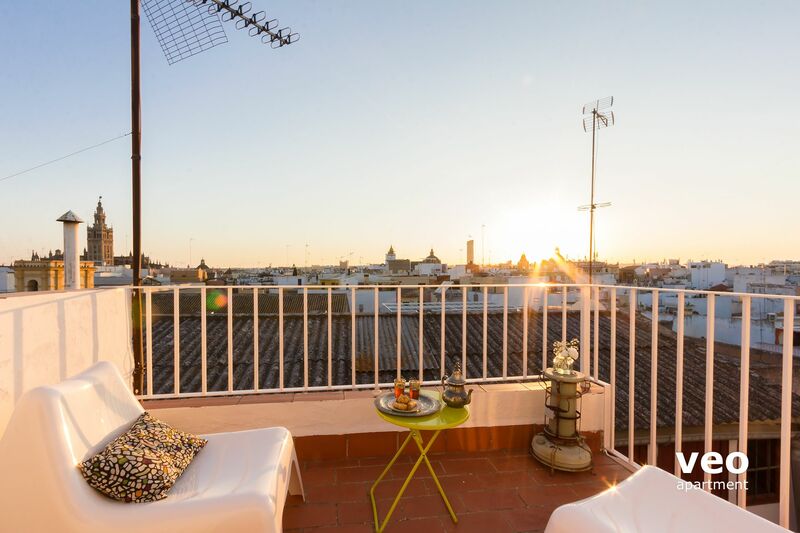 This apartment is in a great location and has a fabulous view over the rooftops to the Cathedral. It has everything you need. As indicated in the description it is not suitable for anyone who does not like climbing stairs - but definitely worth it when you get to the top! 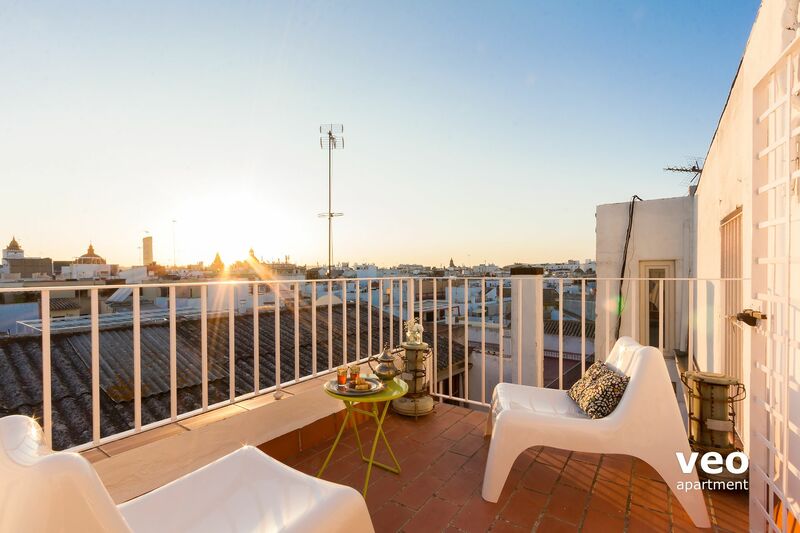 "A very nice flat with a great view"
A very nice flat with a nice terrasse and a Great view over the city. The area is in the heart of the old city center. Very quite as well. "Beautiful, relaxing space with wonderful views and attention for detail." 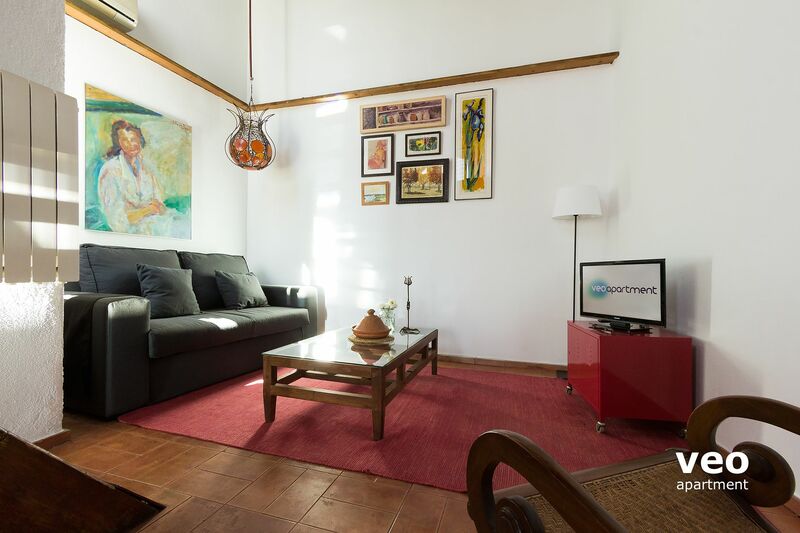 Conde Ibarra Terrace is an apartment that is decorated with great care. 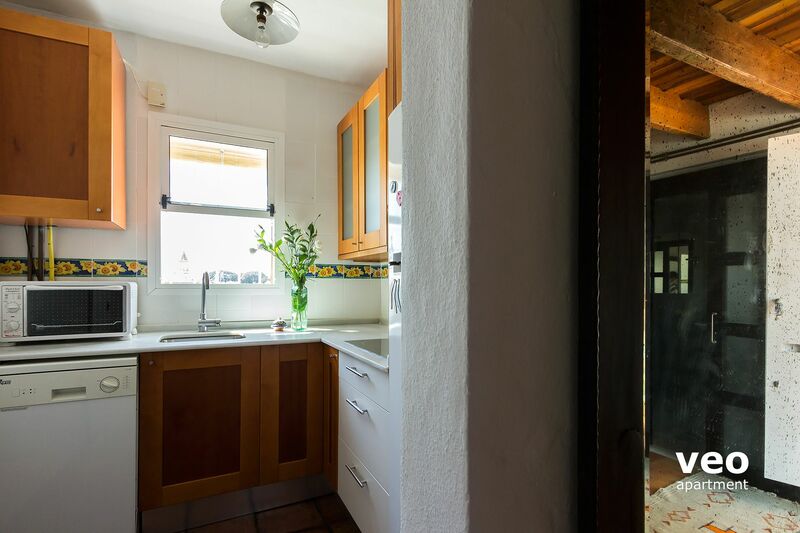 It has wonderful views and everything guests might need to make it their Sevillian home away from home. It's in a quiet street, very close to the historic center. It's worth climbing everyone of the stairs to the fourth floor where it's located. A lovely place to stay.